Zane has always enjoyed exploring the dormant volcano near his home in New Mexico, even though hiking it is challenging. He'd much rather hang out there with his dog, Rosie, than go to middle school, where kids call him Sir Limps a Lot, McGimpster, or Uno--for his one good leg. What Zane doesn't know is that the volcano is a gateway to another world and he is at the center of a powerful prophecy. A new girl at school, Brooks, informs him that he's destined to release an evil god from the ancient Maya relic he is imprisoned in--unless she can find and remove it first. Together they return to the volcano, where all kinds of crazy happens. Brooks turns into a hawk, a demon attacks them in a cave, and Rosie gives her all while trying to protect Zane. When Zane decides to save his dog no matter the cost, he is thrust into an adventure full of surprising discoveries, dangerous secrets, and an all-out war between the gods, one of whom happens to be his father. 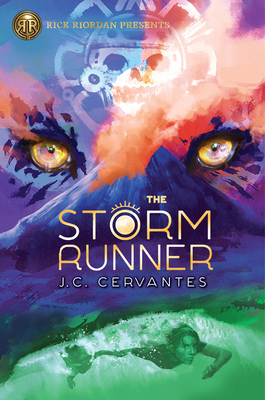 To survive, Zane will have to become the Storm Runner. But how can he run when he can't even walk well without a cane? New York Times bestselling author J.C. Cervantes (www.jennifercervantes.com) also wrote Tortilla Sun, which was called "a beautiful and engaging debut" by Kirkus, an "imaginative, yet grounded novel" by Publishers Weekly, and "lean and lightly spiced with evocative metaphor" by School Library Journal. Tortilla Sun was a 2010 New Voices pick by the American Booksellers Association and it was named to Bank Street's 2011 Best Book List. Jen is an avid reader, a champion for the underdog, and a believer in magic. She is currently working on a sequel to this book, The Fire Keeper. Follow her on Facebook, Twitter: @jencerv, and Instagram: #authorjcervantes.